Sandy Swank, Inter-Faith Ministries' homeless services director, is jotting down the names of men who want to sleep at the organization's Warming Souls Winter Shelter overnight. They're each assigned a number, which correlates with a cushioned mat and blanket in a large room beside them. Inter-Faith has a separate facility for women. 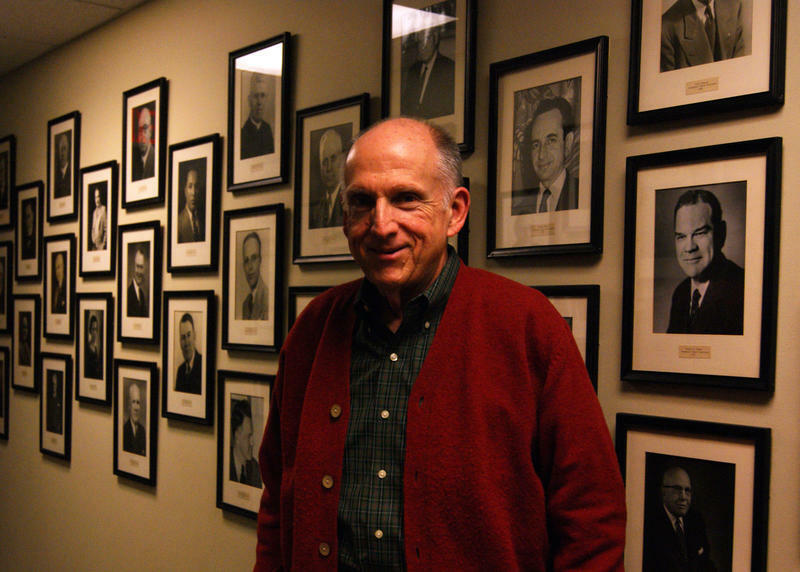 Swank has occupied a number of roles at the nonprofit for more than 25 years. She’s seen a lot of faces in that time, and says they’re mostly humble and grateful. 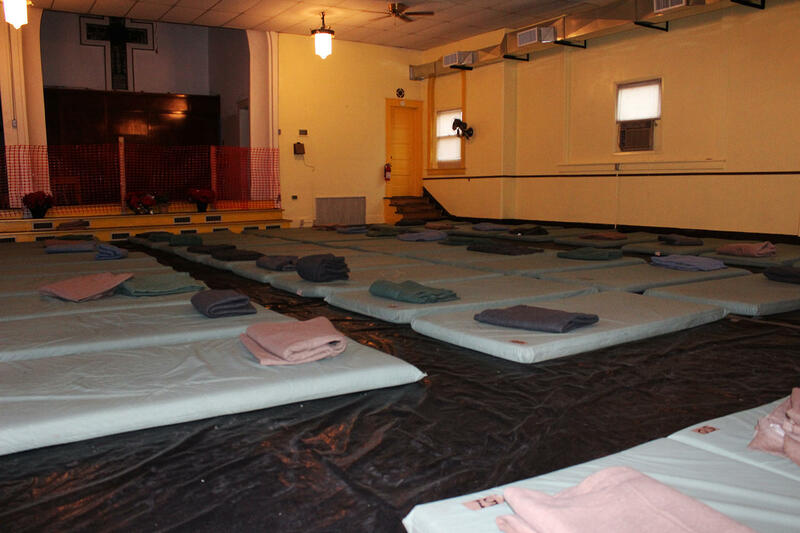 This particular shelter is open during the five coldest months of the year, and will close at the end of March. As for why it's not open year round, Swank says they’re on a tight budget. And Inter-Faith Ministries doesn’t want these men to get too comfortable—settling for 15 hours of walking during the day, and a plastic mat at night. The goal is for them to follow a path similar to that of Jerry Wills. "They know that someone really cares enough to provide the food for them, and get to know them and spend some time with them." That was 22 years ago, when Wills was an alcoholic. 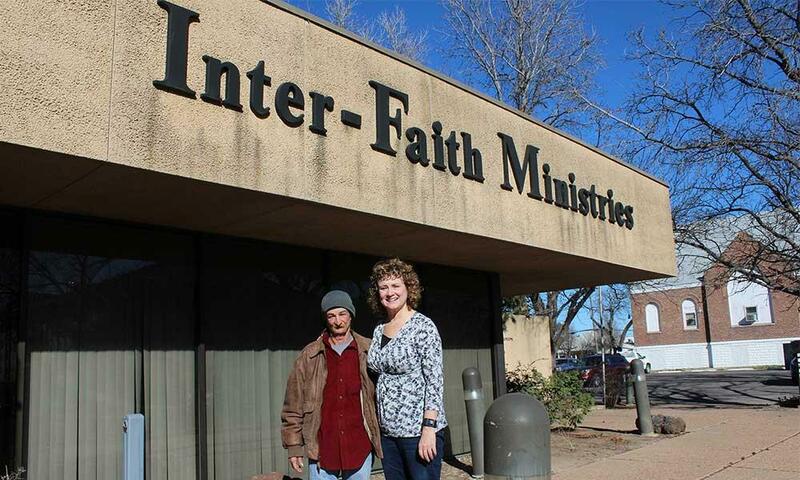 He used the services provided by Inter-Faith Ministries and other local agencies to get sober. That led to his current job as a case manager for the organization. He helps keep track of homeless people, and encourages them to take advantage of any services they might need—services he needed two decades ago. Swank was at the shelter the day Wills came looking for help. Wills was able to successfully break the cycle of homelessness. It took him about a year. For some, it can be a decade or more. There can be a lot of barriers standing in the way of someone finding a permanent home: unemployment, substance abuse, physical and mental illness, criminal records, to name a few. But, there are success stories. Across the street at Inter-Faith Ministries’ offices, Executive Director Anne Corriston meets with a client who has successfully lived in an apartment for a full year. “He kind of inspires me, because I am not as neat as a pin,” Corriston says. She's referring to the "spotless" apartment Randy Barkman calls home. He's a small guy with a big handlebar mustache. “When I go into Randy’s place, I think, 'You know? This guy is doing really, really well,'” Corriston says. Barkman has lived in each and every housing complex Inter-Faith Ministries has to offer. Barkman says his alcohol abuse escalated quickly once he was homeless. He’s also bipolar and has depression. Corriston, who’s worked closely with him over the years, says she saw something finally change in him. Because of his alcohol abuse, it took Barkman more than a decade to make that decision, and he’s far from alone. According to a 2010 report from the US Department of Housing and Urban Development, roughly 34 percent of homeless people nationwide have substance abuse issues and 26 percent have a mental illness. 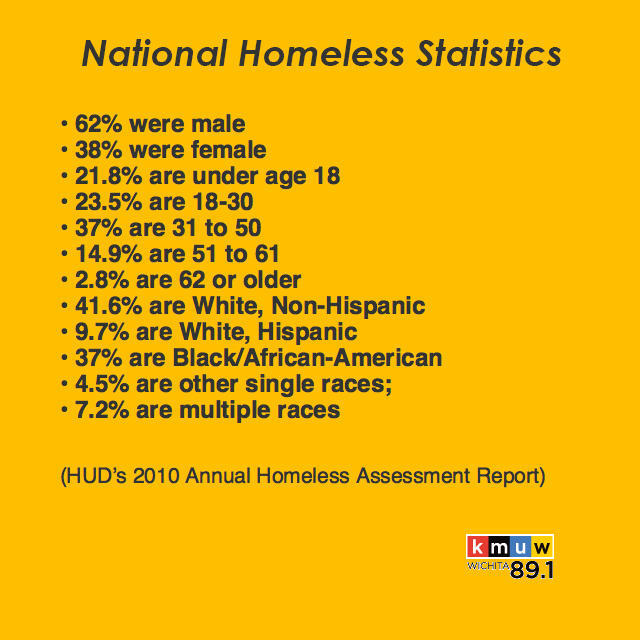 These rates are even higher among chronically homeless populations. Barkman says he witnessed this firsthand. Barkman, who’s in his late 50s, says his age finally caught up with him, and he realized that if he didn’t make a change, he wouldn’t be around much longer. 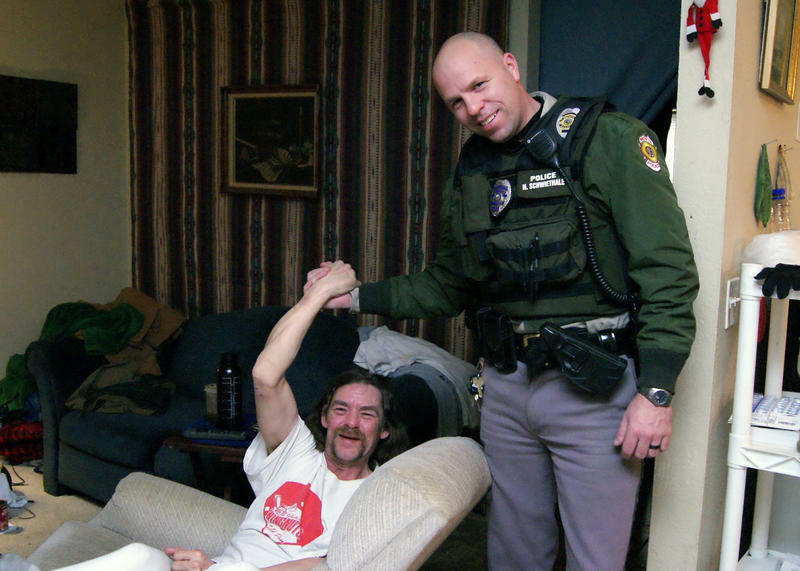 With the help of a case manager, he slowly began to put his life back together. He received help through Sedgwick County’s Comcare system, which provides mental health and substance abuse treatment at little or no cost. He has an apartment through the City of Wichita’s Housing First program, a nationwide initiative that provides apartments for the disabled or chronically homeless. He’s working odd jobs and will soon start to pay rent. That’s the mission of Inter-Faith Ministries. They send staff members out into the streets of Wichita on a weekly basis, talking with the homeless about their options for getting food, medication, and shelter. Corriston says Wichita has a great network of services that are waiting to be used. But she says that many homeless people don’t want to ask for help, or don’t trust those who are offering it, and that can be frustrating. “We can sign people up for housing, we can talk to them, but if they’re not following through with appointments, they’re not going to be successful,” Corriston says. But she says the organization never gives up on people. Randy Barkman used Inter-Faith services for more than a decade before finally getting out of the cycle of homelessness, and Corriston thinks that’s possible for everyone. 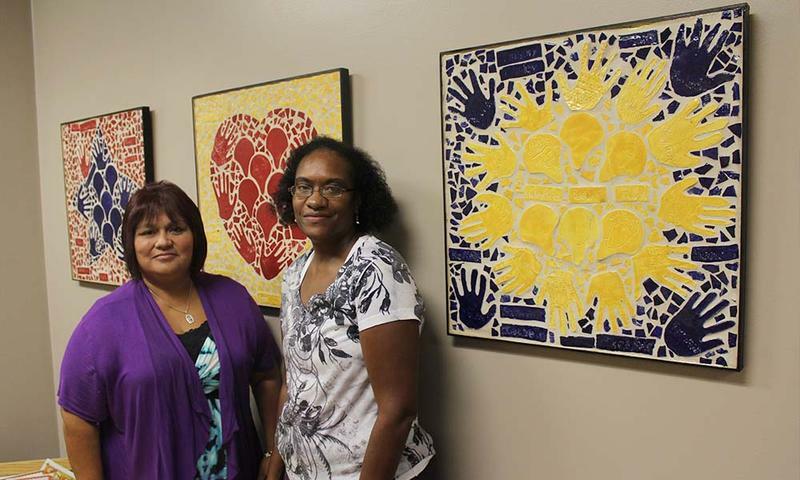 Each year, Wichita Public Schools face a familiar challenge: meeting the needs of thousands of homeless students. Each case is different—some families are living with relatives, and some are living out of their car. To address the issue, the district relies on the federal government’s McKinney-Vento Homeless Assistance program. As KMUW’s Sean Sandefur reports, it can bring a level of normalcy to an otherwise chaotic situation. The count showed that there are about 11 percent fewer homeless people in Sedgwick County. 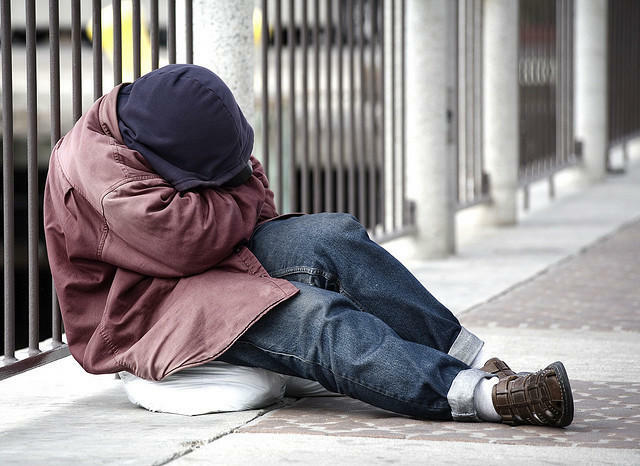 An estimated 561 people in were found to be homeless, down from 631 in 2014. Pat Hanrahan, President of United Way of the Plains, says the numbers are used to allocate funds to the community based on need. A variety of services are offered to the homeless at the event as well. The United Way of the Plains holds an annual event called the Point In Time Homeless Count every January. It’s an effort to make sure local homeless agencies have a good feel for the extent of the homeless population in Wichita. Pat Hanrahan is the President of United Way.